I decided at the last minute to make a teacher's gift for my son's Kindergarten teacher. I finished it in two days! I used (42) 10" print squares and (84) 4.5" white squares. Place the white squares on opposite sides of the print square and sew corner to corner. Trim, leaving 1/4" seam allowance. Ta-da! Insta-quilt! I love that it's really simple to put together, but still looks like I put some effort forth! I even had some backing fabric on hand that was from the same designer as the prints on the front! The quilting went quickly since I got to use my baby (my Tiara). I'm working on a video review of that by the way! I've made the video, I just have to write the post! Is there anything stranger than listening to yourself on film? I end up sounding like a Southern Elle Woods or something. ha ha! After trimming the corners from the quilt at the top, I had all these perfectly matched triangles of prints/neutral all ready to sew! I whipped out this baby quilt in no time! I'd been wondering what to do with that yard of Meadow Sweet 2! Perfect backing! I opted for a coral linen binding for this one. I like the added texture. I also quilted more densely than I do on larger quilts. Makes for an extra crinkly, cuddly quilt! This one will go in my Etsy shop soon. I adore pixelated hearts! This one has a completely different look than my last one, but I love it! It's bright and fresh and summery! 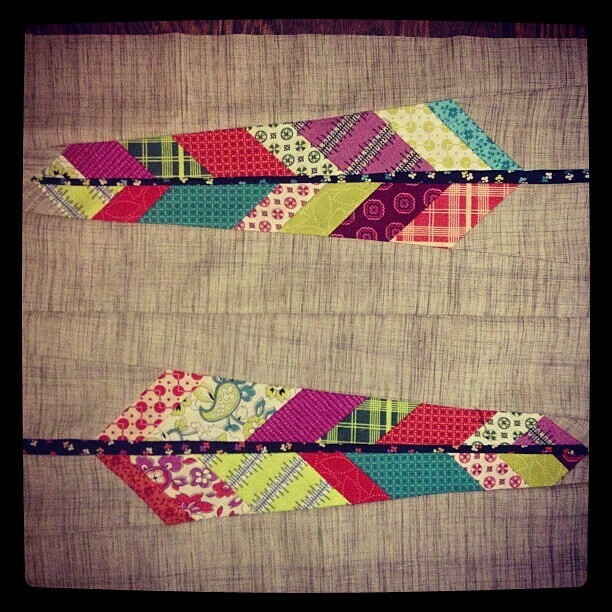 I used the Remix zig zag print and cut it on the bias for the binding. I usually don't make bias binding, but I had a feeling this would turn out cool (and I was right!) It sort of reminds me of a Greek key pattern. Just love it! I also designed and made this ballerina quilt for Kelle (Ann Kelle). I based it off of THIS quilt by Kati. I'm not sure if Kati used a pattern, but I designed one to fit the dimensions of the ballerinas. Doesn't it look like candy? I love all the solids! And there are loads of ballerinas on the back too! This fabric line is just too stinkin' cute!!!! I'm also making some progress on my pillow for PTS10! I just have to decide how I'm going to quilt it! Decisions, decisions! Whew!!! That is a lot of lovely! Love all your work! That is one lucky teacher!! Who is the designer of those fabrics, some really nice ones in there. Would like to keep an eye out for new collections of this designer. 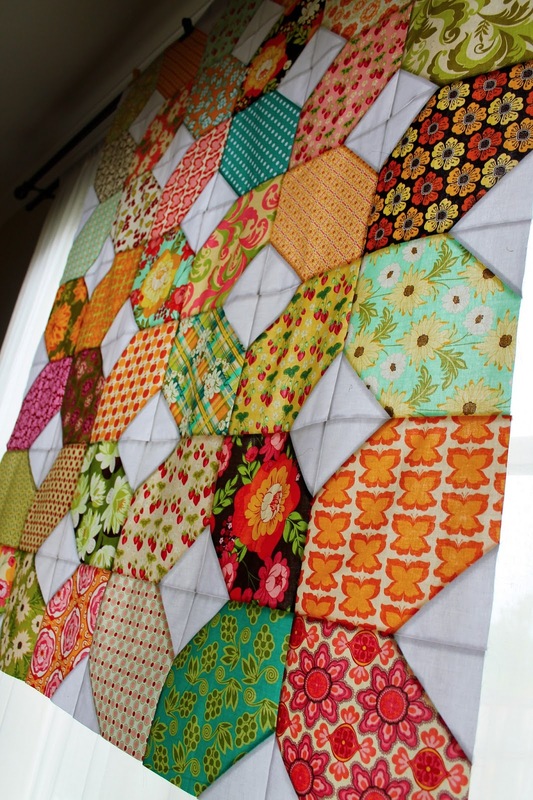 What genious to use the discarded corners to make such an outstanding quilt! The heart, well, the binding is my fav. The first one took my breath away. The color combo is...breath taking!! They are all beautiful. I absolutely LOVE the remix zig zag bias! Oh my, you were busy and they are all so lovely! 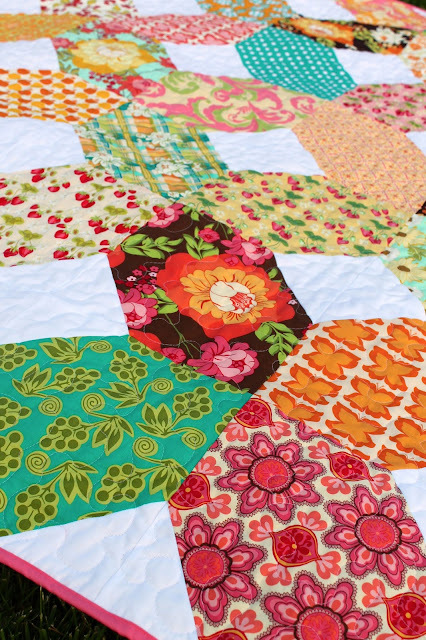 Love your quilt using the bonus HSTs. I always feel like I'm getting something for nothing when I find a use for them! So satisfying. Your quilts are gorgeous - as always! 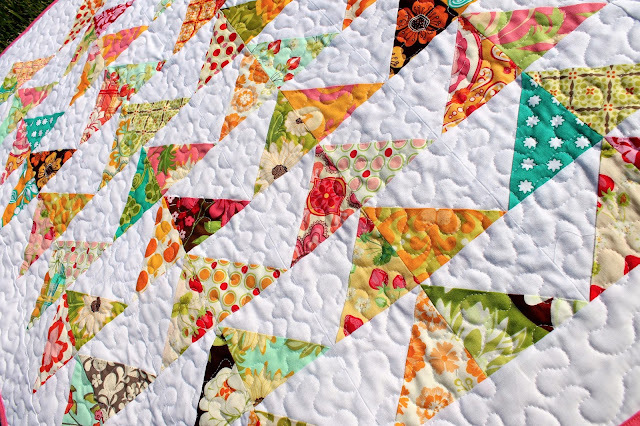 All of these quilts are stunningly beautiful! I love them all! 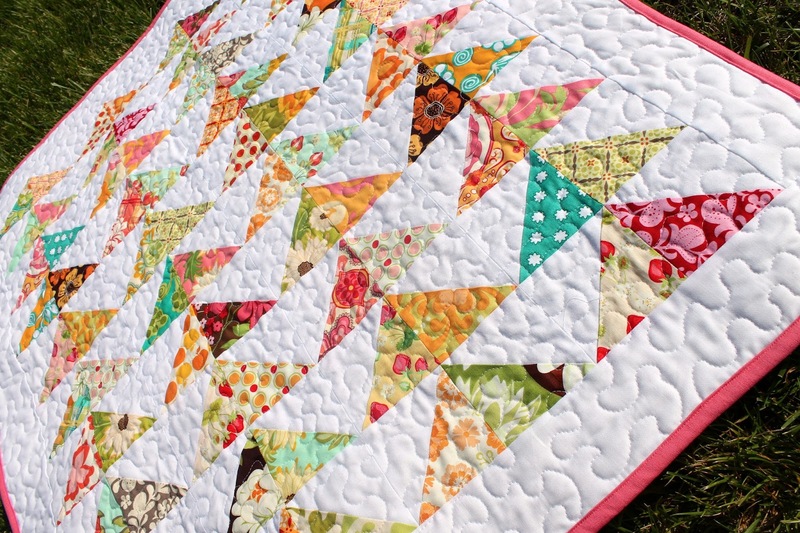 Love how your little ballerina quilt turned out. I didn't use a pattern either. I did the same and just made everything fit my fussy-cut centers. I made each block individually because none of my center prints were the same size. Busy girl, they all look great! BTW, I was just wondering to myself if I could make a quilt like that first one with a layer cake, and what it would look like, now I know! I just LOVE that ballerina print! That quilt is beautiful too. I love every.single.thing. in this post! Wow, some seriously beautiful quilts. I'm working on one like your beautiful teacher quilt for do. Good Stitches, only smaller scale. I love the pattern and have a layer cake waiting to be used, I might just have to give it a try on the larger scale. Love them all! you're amazing when you get on a roll! Love these quilts! That Ann Kelle squares one is so adorable! Kelly - I love the quilt on the top using the 10" squares. Question - did you use 5" squares that were trimmed for the white squares, or did you cut out 4.5" squares from yardage?? That's a lot of cutting if you did! I'd love to hear your secret!